At least I did learn a lesson from studying these photographs. 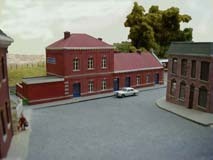 The purpose of these photos was to register the various buildings, not a presentation of the layout. Only after selling it, I realised that I didn't have much material on the items built. These photos are picked out of a larger set for reasons of not having a distracting background, also lighting conditions were too bright to do much justice to colour effects. However blowing up the images like this show that a digital camera can be a very useful extension of the modelling tools. It immediately shows you where further work or restoration is necessary. Further it makes it clear that you better finish a building entirely and immediately bring its surrounding area into final condition. If left until later you get this effect as on some of the buildings here that were meant to receive an interior but in reality are never finished at all, because there are always other things requiring attention first. The Iron Rhine was a railway built in 1879 and running eastwards from Antwerp via the Netherlands to Mönchengladbach in Germany. The line was built by the Grand Central Belge (GCB) company at that time a major railway in Belgium. With this line they had running powers from France to the German border and the Netherlands. Business florished due to connecting the harbour from Antwerp with the heavy industry in the area around Charleroi and northern France, but also connecting the harbour with the backland of Germany. The Iron Rhine soon became an important goods line and in 1893 plans were developed for double track extension. However in 1897 the State Railways acquired the GCB and the plans were postponed and not realised until 1907. After acquiring the line the state railways did carry out various adaptations such as extending buildings and new halts. One of these actions was extending the buildings with a central top with second floor to improve the living quarters for the personal. The layout shows such an extended building. The ground floor is the original standard design of the GCB with its characteristic style. 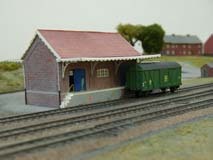 The length of the buildings was dependent on the importance of the station. Spaubeke was the smallest version. The ones in Neerpelt where the Luik-Limburg line crossed and the border station in Hamont being much larger. Hamont even received two top-ups. During the WW1 the Netherlands was neutral territory therefor all traffic to Germany was led over a new line more south. Beyond Mol the line was undoubled and never built back. After the war it never got back the status it once had. It even lost part of its passenger service although this was restored again later. Currently the NMBS is trying to revive the line again as international connection, however for reasons of competion between Antwerp and Rotterdam an insignificant nature reserve near the german border is used as environmental argument against reopening by the dutch government. (At same time they have no trouble at all destroying likewise nature areas for the HST). 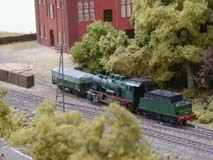 Spaubeke was a free lance layout and depicting a small village situated at a part of the single line between Mol and Neerpelt. 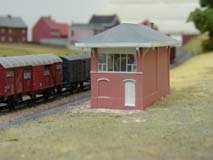 All railway related buildings can be found along the line. Also all buildings from the village are based on existing buildings but from a wide area. The trackplan comes from an entirely different country. All stations along the line were rather long and straight, a curved station suited me better. However for Fremo use the useful track length was rather small, with 1.2m about half the length it should have had. 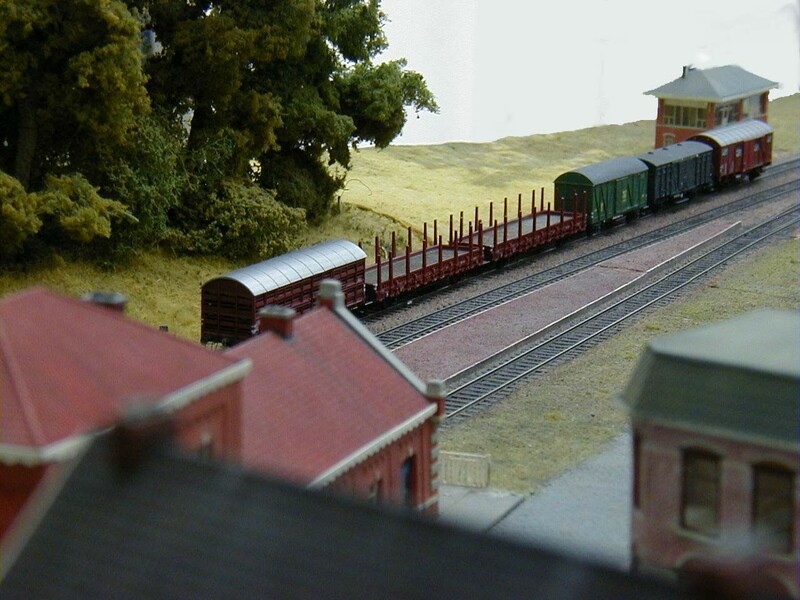 This was a major reason to base a new layout on a real station. A full rebuilding formed an alternative but was for other reasons decided against. 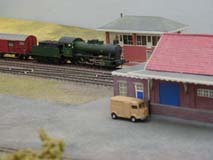 At the time of these photographs the layout was over 10 years old. The track had been layed twice, starting out in code 55, then into NEM compatible code 40 and finally rebuilding the points to FS160 standard. 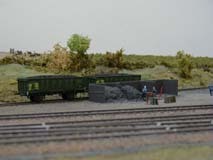 Contrary to english practice Fremo layouts don't have a background because there is no back or front, layouts can be viewed from all sides and therefor smuggling with buildings without back is impossible.